China poses a serious and growing threat to the United States, particularly in the field of technology, U.S. intelligence leaders told a Senate hearing Jan. 29. “Chinese pursuit of intellectual property, sensitive research and development plans, and U.S. personnel data remains a significant threat to the United States government and the private sector,” Director of National Intelligence Dan Coats testified at the Senate Intelligence Committee’s annual hearing on worldwide threats. The directors of the CIA, FBI, and other top intelligence officials also testified. In a hearing focused on technologically advanced security threats, intelligence officials described aspects of the Chinese regime’s multifaceted plan to surpass the United States as the world’s superpower, including through intellectual property theft, military expansion, and gaining global influence through investment programs under its Belt and Road Initiative. The warning comes just a day after the Justice Department unsealed two sets of indictments against Chinese tech giant Huawei Technologies Co. The first case accuses the company, as well as Chief Financial Officer Meng Wanzhou, of violating U.S. sanctions against Iran. The second alleges Huawei stole trade secrets from U.S. mobile carrier T-Mobile. The hearing also covered threats posed by Russia, North Korea, and Iran, and interference in U.S. elections. Echoing previous comments made by officials and lawmakers, FBI Director Christopher Wray spoke of the seriousness of the Chinese regime’s threat to U.S. national security. “The Chinese counterintelligence threat is more deep, more diverse, more vexing, more challenging, more comprehensive, and more concerning than any counterintelligence threat I can think of,” Wray said. Coats said the communist regime’s actions reflected a long-term strategy to achieve global superiority. “Frankly, while we were sleeping in the last decade and a half, China had a remarkable rise in capabilities, that are stunning,” Coats said. 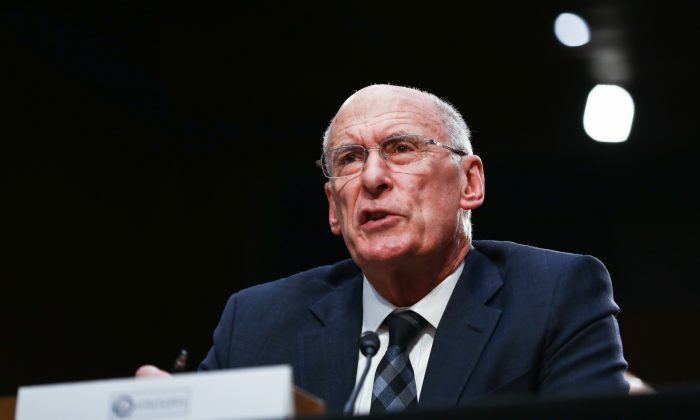 Coats said intelligence officials have been working with the business community, meeting with corporate executives to discuss espionage threats posed by China. The United States, Coats said, also has warned its allies about the risks of doing business with China, and these allies are now questioning their dealings with the communist country. “[Our allies are] now finding their product has been duplicated by the Chinese and sold at half the price because they didn’t have to spend as much money on research development,” he said. Sen. James Risch (R-Idaho) referred to the actions of Chinese state-owned chipmaker Fujian Jinhua, which is accused of stealing trade secrets from U.S. semiconductor company Micron, relating to the production of memory storage devices. In November last year, the Commerce Department blocked U.S. exports to the Chinese chipmaker. Around the same time, U.S. prosecutors indicted Jinhua, and its business partner, Taiwan’s United Microelectronics Corp., and three individuals for conspiracy to commit trade secret theft, economic espionage, and related crimes. Sen. Mark Warner (D-Va.), the top Democrat on the committee, said corporate espionage is sponsored by the Chinese Communist Party (CCP). Wray said Americans and U.S. allies are just now starting to understand how the communist regime operates. Sen. Angus King (I-Maine) referred specifically to Huawei, saying the company had a choice of either being a global telecommunications company or an agent of the CCP.